I’ve just returned from a week on the road. We held donor appreciation luncheons in three cities in Tennessee. I took advantage of the travel to that part of the country to add on a few days to visit friends and family. This was my first flight since I started treatment in January. I figured this trip would be a test of my stamina and overall it worked out well. I first flew into Memphis. Several members of my fellow Priests of the Sacred Heart work just across the State line in Northern Mississippi, and I spent two days catching up with their work. As the area has grown from small country towns into good sized cities, they have built new churches and expanded their services. I appreciated the hospitable way the priests and brothers sat long and talked much over supper at the community house. I joined Steve, a good friend I first met in college, and his wife Susan for lunch on Tuesday. Then I visited family friends, Buck and Carolyn and their son Jeffrey who live in the area. I capped off the evening when Fr. Ed took me to see our mutual friend Lyle. The two of them helped me enter into their Holy Land pilgrimage via their pictures and stories. Fr. Tim said, “We’ve been praying for you all these months and now here you are with us, looking just like your old self – you seem like a walking miracle!” When I get impatient with my own recovery, others remind me just how far I have come. I drove on to Nashville, a little over 200 miles, and stayed with my cousin Mick, his wife Christine and family. I stopped first at his shop where he builds kitchen cabinets, then went to their home. After supper two of their children asked about playing a game of password, and the fun and laughter we had made the night so memorable. I enjoy learning about history, and on my way to Knoxville first stopped at the Hermitage, President Andrew Jackson’s home and plantation. The exhibit highlighted his many political and military achievements, but minced no words about his staunch support of slavery, and his Indian removal policy. His forcing the Eastern tribes to relocate west of the Mississippi led to the tragic Trail of Tears. Andrew Jackson’s house saw so much history. The grounds were spacious and beautiful. I felt my limitation as I had to walk so slowly and couldn’t cover the ground I usually do. I had to leave a lot unseen. I met our St. Joseph’s crew at the Knoxville airport. The Hills of Eastern Tennessee are gorgeous. I’d love to see the fall colors, which must surely be amazing. Henry, one of our donors, met us at the airport, treated us to supper, and made sure we found our way to the hotel. We were right next to a 60 foot basketball outside the Women’s Basketball Hall of fame, which made quite an impression on our two girls. Devona and Irene are our two 7th graders who were selected to make the trip. They represented St. Joseph’s well. Of course they were most nervous the first time in Knoxville, but our kind and gracious donors made them feel appreciated, and that their words were worth listening to. By the luncheons Saturday and Sunday, they were more relaxed and able to be themselves. Our donors come from such a wide variety of backgrounds and careers. They like putting a real face to a picture in the mail. Yet it’s just as important for us to realize the kind and caring people behind a signature on a check or an email typed to our web site. The luncheons are a chance to say thank you, and give people who may never get to actually visit St. Joseph’s a chance to find out more about us. At all three luncheons I so appreciated meeting the folks who came. We drove on to Nashville and arrived in the midst of a riverfront festival and the regular crowds that pour into the heart of downtown on a Friday night. Usually I’m the one in front leading the way on walks, but touring the streets of downtown Nashville, past the Ryman theater and the music venues on Broadway I brought up the rear as I limped along. My leg isn’t so much in pain as it is weak, and I just can’t move as fast as I want. We ate BBQ for supper, found the souvenir shops, and listened to some Country Music. After the Memphis luncheon, we hopped on the Trolley that made a loop around downtown. I made sure to point out the Lorraine Motel, which is now the National Civil Rights Museum, where Dr. Martin Luther King Jr. was shot and killed. History seems more real when you get to see and experience the places you read about in books. Maybe the significance will click for Irene and Devona years in the future. We didn’t get to Graceland, but Devona sat at table with a donor who went to school with Elvis when she was in 7th grade, and told a few stories about the King. We did some touristy things. The girls delighted in seeing the Ducks board the elevator at the Peabody Hotel. We hunted for souvenir shirts and key chains and coffee mugs on Beale Street, and while eating supper listened to Blind Mississippi Morris sing the Blues. Neither girl had ever heard Blues before, and weren’t quite sure what to make of it. But the music sure had my toes a tapping. activities you are doing now, and I knew that you would be again…..as I had a talk with GOD in the beginning;…and knew he would do his part, with our PRAYERS, and BELIEVING. I do continue to PRAY for your continued recovery, and for our benefits from your work. WE ARE SO BLESSED. Please keep the good news coming. Gollies..How remarkable..! But NOT remar kable for Fatherf Steve..! IWe think “Overcoming” is your middle name.! We are so happy to hear that the trip went well…! An awful lot of people must have realized their blessings when they met with you..! You do not realize what a blessing you are to the whole world..! 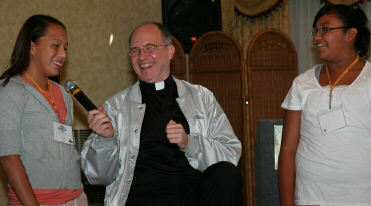 Thanks be to God for Father Steve..! Sounds like you and the girls had quite a great visit to Tennessee. It sounded like so much fun that we could almost experience it with you. We’ve never been to Tennessee ourselves but have seen the places you talked about in books and movies. Hope your strength returns to your leg soon. You’re always in our prayers, whuch you already know. Have a great achool year and tell the kids to keep their grades up for us. I can really relate to your blog today.Noelle, our middle child is a ph.d student at Vanderbilt in Nashville. We moved her into her apartment last summer just after my chemo ended. I was very weak, could hardly walk any distance at all. We did the tour of the Hermitage in 90 degree heat…You can really appreciate the limits your body puts on you. Dined at the BB Kings club, and saw the incredible sights of Nashville. It is beautiful country. I am so glad you had such a great trip. Be assured of our continued prayers for a “full recovery”. Sounds like you are well on your way! Well, Father Steve, I’m gratified to know that your trip to my beloved home state of Tennessee was so satisfying! I really regret that I could not travel down to Knoxville from Kingsport to meet you, Devona and Irene but it just wasn’t possible. I’ve made the Hermitage tour too and it is quite a challenge and experience. Even though Ol’ Hickory had his flaws and blemishes of character, we in Tennessee are proud of his time as an early President of the then young United States. The fact that you successfully undertook that trip and all that it involved speaks volumes about the blessings heaped upon you by God. I’m so thankful! And it was truly lovely to read about your visits with friends and family. The previous blog about the start of the school year was equally enjoyable to read. I have shimmering images in my mind’s eye of what it is all like and I feel much closer to everyone at St. Jo thanks to your blogs! May God bless each and every one of the community there!